Dubai, UAE: The Mohammed bin Rashid Space Centre (MBRSC) – the entity delegated to design, implement and supervise all the phases of the Emirates Mars Mission (EMM) – Hope, under the supervision of the UAE Space Agency, has launched the 2nd Annual EMM Science Workshop which aims to shed light on the history of the Red Planet and its evolution over millions of years, as well as other scientific research. The workshop hosted the former NASA astronaut, Marsha Ivins, and Dr. Bruce Jakosky, Principal Investigator for the MAVEN mission. Under the title of “Space Walk”, Ivins shared her experience in the space field and the missions in which she took part. Dr Jakosky spoke on the topic of “Can Life Exist on Mars?”, and if there is, what would be its forms and manifestations? He also spoke about if there is water on the Red Planet. The 2nd Annual EMM Science Workshop was held with the participation and the presence of around 120 students, graduates and professors from UAE universities, the international scientific community, as well as students from the Research Experience for Undergraduates (REU) programme. The participants discussed 20 presentations on Mars science and the atmosphere. One of the presentation entitled “Why Mars?” answered questions about the reasons behind conducting scientific research and sending unmanned missions to explore Mars. Moreover, another presentation entitled “The World of Science fiction”, gave an insight about how science is being depicted through various science fiction movies and the truth behind them. Also, 10 posters of those submitted in the Explore Mars Poster Competition were presented in the workshop. 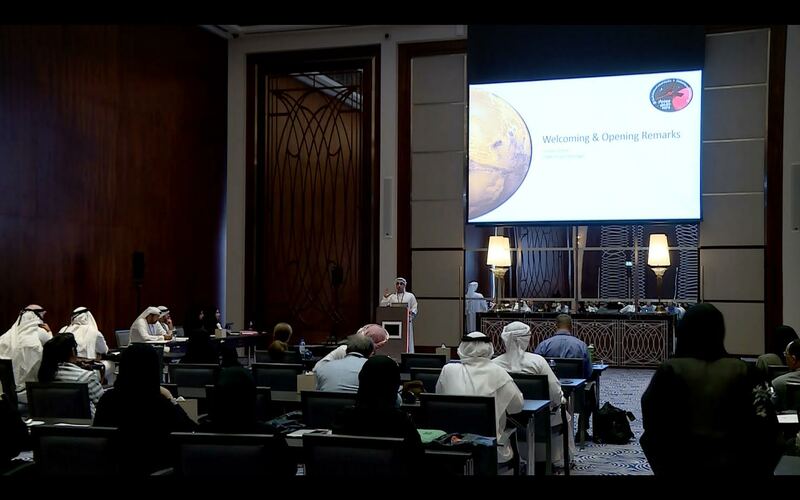 Commenting on the categories of participants that were targeted by the workshop, Sharaf said: “We are aiming at educating all categories and age groups about Mars science and space technology. Thus, the EMM science team targeted participants on two different levels. The first was the entry-level represented by individuals who do not have a scientific background, yet eager to uncover the secrets of Mars, the second was the intermediate level represented by specialists, college students, graduates of the scientific and engineering disciplines and those wishing to deepen their knowledge of Mars science. “Developing national competencies is a primary target of the Hope project, as driving the technological progress and scientific discoveries in the future needs a qualified generation of experts and scientists who can keep pace with the scientific and knowledge revolution accelerated all over the world,” Sharaf concluded. At the end of the workshop, winners of the Explore Mars Science Competition were announced and awarded with cash prizes.